causes a perception in another different one. "Would that explain why the first note I played on the piano was green?" I had never said that aloud or told anyone that I see everything I hear. Yet, I had never forgotten it. Rather, I had never brought it to a level of consciousness where I translate body experience into words. Excited, I decided to do a little research. I did not get very far. When I found Synesthesia listed in a medical dictionary between Seizures and Syphilis, I quickly lost my enthusiasm and forgot about synesthesia for another twenty years. Then in 1999, I picked up a New York Times and read an interview with Carol Steen, a synesthete and artist in New York City. She put into words what I had known but had never said to anyone, not even to myself. The article included her e-mail address. I sent a message with the header: "I hear with my eyes." She answered right away. “Welcome to the club, you’re in great company." I wanted to believe her but felt as though I had just come out of a closet that, until that day, I had not even known existed. I have been learning about synesthesia ever since. One of my earliest discoveries was that I have been using my synesthesia to create artwork for years without giving my process a name. I taught myself to take pictures by shooting whenever I experience a synesthetic reaction to what I see: if I experience a sensation of texture, motion or taste, I take the picture. If the reflection elicits the sound of cello, I shoot the picture. 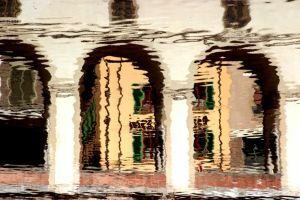 I photograph reflections on moving water. It works like this: I watch the surface of the sea until I experience one of my synesthetic responses. When I do, I trust it to be a reliable signal that tells me it is the right time to take the picture, so I click the shutter. Within the creative process, I think of my synesthetic responses as vital messengers that arrive faster than thought to deliver one urgent message which I always heed: beauty is lurking. I call myself a Reflectionist because I photograph reflections on water. I use the surface of the sea as my canvas, the wind for my brushes, and I rely on the season and location to produce my palette. I never manipulate the water or change a picture after I take it either. Why would I when my goal is to capture on film what Nature already provides? So, my question is this: is it my synesthesia that takes me to images that are never hidden but usually unseen? Please look at some examples and help me answer that question. If you click on the images above, each will take you to a different form of synesthesia. Also, please visit my Blog where I provide additional examples. Thank you for visiting and please write with any questions or insights. I love the feedback, it is how I learn. Please click on the images above. Each takes you to a different form of synesthesia.